Cyient, a global provider of engineering, manufacturing, networks and operations services, and analytics solutions, announced that it has signed a Memorandum of Understanding (MOU) with ANSYS to set up a Simulation Lab at Cyient’s Experience Center in Hyderabad, India. The lab brings together Cyient’s expertise in service design, delivery, and operational excellence with ANSYS’s market-leading engineering simulation solutions and services to drive the development of innovative proof-of-concepts for Cyient and its clients. The partnership with ANSYS is aligned with Cyient’s long-term vision of establishing itself as a Design-Build-Maintain partner to its clients worldwide. The goal is to co-innovate and develop proof-of-concept (PoC) and new solutions across multiple industries such as Aerospace & Defense, Rail Transportation, Energy, Utilities, Off-Highway and Industrial, Oil and Gas, Communications, Medical Technology, and Semiconductor. 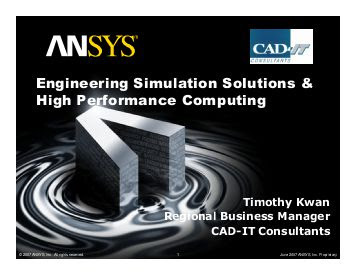 ANSYS will provide access to various training materials, curricula, and eLearning systems for latest versions of their product platforms to help achieve this objective. Commenting on the partnership, Krishna Bodanapu, CEO, Cyient, said "The Simulation Lab in collaboration with ANSYS, a market leader in this area, is indeed a testimony towards our relentless commitment to nurture a culture of innovation at Cyient. This is the next step towards encouraging associates to not only address product design and engineering challenges across industries but also to capitalize on emerging opportunities in the marketplace. I am very optimistic about the learning and innovation possibilities this lab will open up”.